Originally published in Cultural Survival Quarterly (27.4 – Winter 2003). Taking their cue from the “old ways” of tribal traditions and knowledge construction, the authors envision a “truly American Indian,” or indigenized, educational practice grounded literally in power and place. Power is understood as the “living energy that inhabits and/or composes the universe,” and place is the “relationship of things to each other.” As Deloria notes, “power and place produce personality,” meaning not only that experience of the universe in a particular place is inherently personal, but also that the universe itself is personal. Personality is thus the “substantive embodiment, the unique realization, of all the relations and power” emergent in a given place. Moreover, because the natural world is personal, “its perceived relationships are always ethical,” and appropriate action therefore requires careful discernment of nature’s messages, as well as subsequent behavior that considers all possible consequences and ensures relationships are completed. An indigenized educational practice thus begins with the explicit aim of establishing personal relationships with the natural world, through living experience in a particular place. The exploration of such experiences becomes the source of both personal and communal identity, as well as the knowledge and wisdom for how to live ethically and well—“attentively, respectfully, and responsibly”—in the world. Indigenized education is foremost a polite endeavor with the intention of maintaining good relationships. Having articulated an indigenous metaphysical orientation, Deloria and Wildcat proceed to deconstruct Western metaphysics through insightful commentary on the shortcomings and contradictions of Western science, technology, religion, ethics and politics, and materialism and consumer culture. They argue convincingly that the central problem with Western metaphysics is its “failure to produce a coherent worldview encompassing the processes of the world and how we humans find meaning in those processes.” This “schizophrenic nature” of Western metaphysics pervades formal institutions of education, presenting Native students with dichotomies (such as between facts and values, or “science-versus-religion”) that simply do not exist within indigenous worldviews. Moreover, Native students are confronted with “expert” constructions of the world that frequently contradict indigenous traditions of knowledge and experience—the latter are, in fact, denigrated as “impossible” or “superstitious.” That indigenous people have long-since arrived at conclusions which modern science is only now beginning to understand does not even enter curricular discussion. Ultimately, Deloria and Wildcat demonstrate conclusively that the “problem with Indian education” is really the problem of education itself, which, as a system of indoctrination to a crumbling worldview, fails to provide students with an adequate understanding of how to think critically and curiously, and how to live responsibly in the world. Although Power and Place engages numerous heady subjects, particularly metaphysics, Deloria and Wildcat present their arguments in a personable style, and the book is refreshingly accessible. Indeed, specialists might consider the lack of detailed annotation and theoretical precision as detraction from the otherwise brilliant impetus of the authors’ vision. However, Deloria and Wildcat are explicit in their criticism of the “specialization” that characterizes much of what passes for education in Western institutions of higher learning. 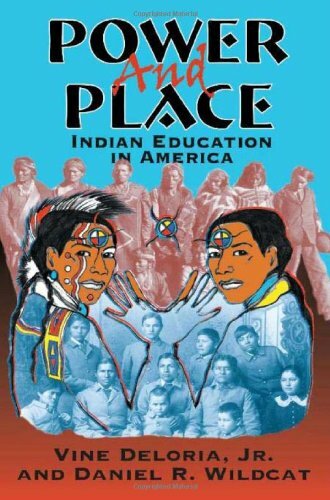 Power and Place is written instead for administrators, educators, students, and community leaders involved with the daily practice of Indian education. Wildcat captures the essential purpose of the book when he contends that experience “remains the unexplored metaphysical terrain of the twenty-first century. And it is likely that the best scouts will be Indians … because there remains among many of us a predisposition to live in the world as opposing to living on, above, or in control of the world.” Thus is Power and Place a reference manual for those scouts daring to assert and establish their cultural sovereignty and individual and community self-determination as indigenous people emergent from a place. Jason Schreiner is an independent scholar and lives in Lawrence, Kansas. He will be pursuing a master’s degree in environmental studies beginning in 2004.